Friday afternoon, I took a train to Yogyakarta. A 14-year-old boy across from me blew smoke in my face from his cigarette, and there was no air-conditioning, but for only a dollar I wasn't complaining. I walked to the backpacker area in Yogyakarta from the train station and booked a closet-sized room in a losmen (guest house). Like most places in Asia, I had to remove my shoes at the door, but I found it a bit hypocritical that motorbikes were rolled inside each evening and parked in the middle of the tiled common area. 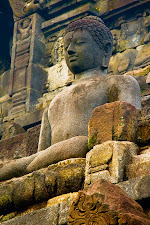 I booked a tour for the next day to Borobudur and Prambanan, both of which are UNESCO World Heritage sites. The minibus left Yogyakarta at five o'clock in the morning and arrived at Borobudur at six o'clock, just when the gates were opened. Although Borobudur is the most visited attraction in Indonesia and one of the most famous temples in Southeast Asia, arriving just after sunrise assured that the place was pretty desolate. The lack of tourists, coupled with the thick morning fog, lent a meditative and mysterious atmosphere to the place. I explored the many stairways and levels of the temple, admiring the lush, misty countryside that stretched in all directions. 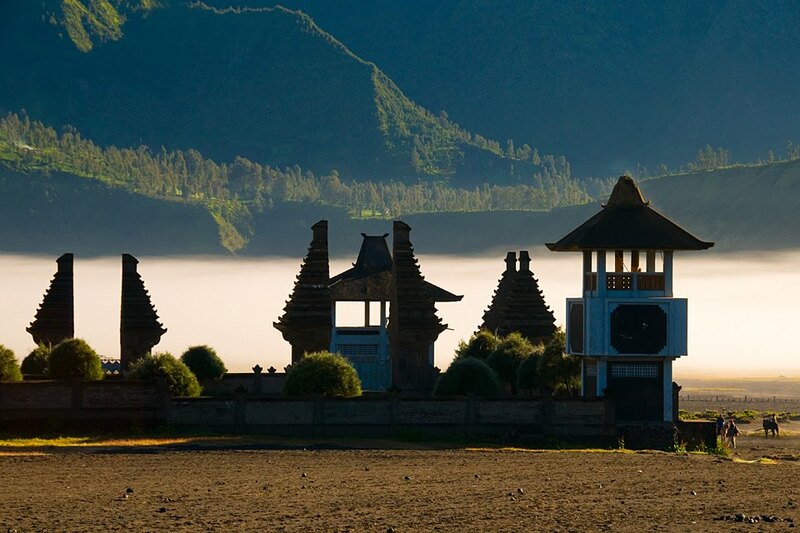 Morning fog shrouds the Borobudur Temple near Yogyakarta in Java, Indonesia. 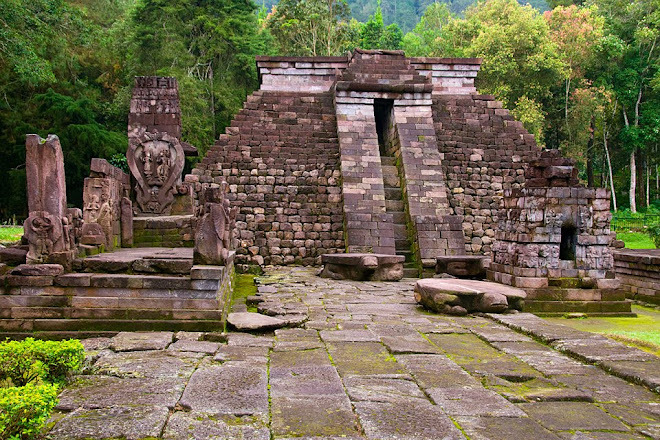 The massive structure – 400 feet on each side – was built in the ninth century and was only rediscovered in the early nineteenth century by the British, who governed Java at the time. These first Europeans to glimpse Borobudur found it crumbling under jungle vegetation and centuries of volcanic ash. Standing near the summit of the temple, shrouded in fog, I could almost imagine this place as a lost temple. 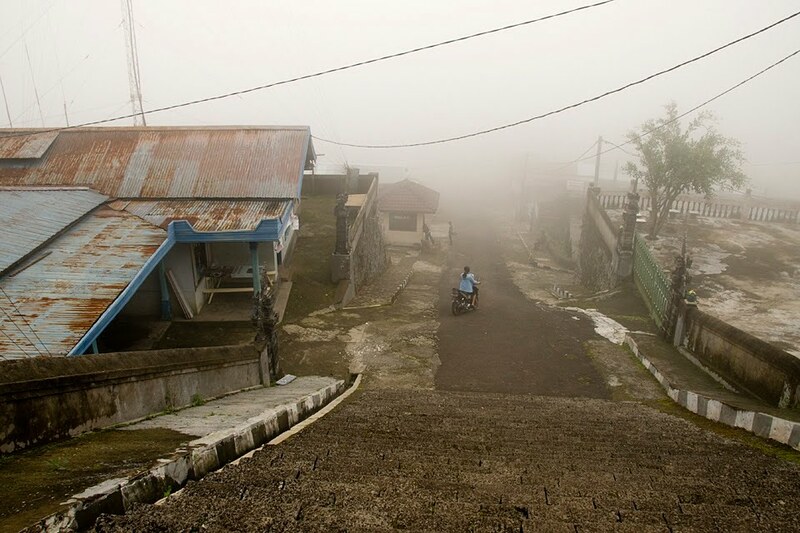 As the sun rose in the sky and the fog lifted, busloads of Indonesian children arrived in school groups, and the temple was soon crawling with tourists. By eight o'clock, the temperature and humidity had soared, and Borobudur quickly became just another hot and overcrowded tourist attraction typical of Southeast Asia. I feel fortunate to have experienced the rare magic of the temple at sunrise. 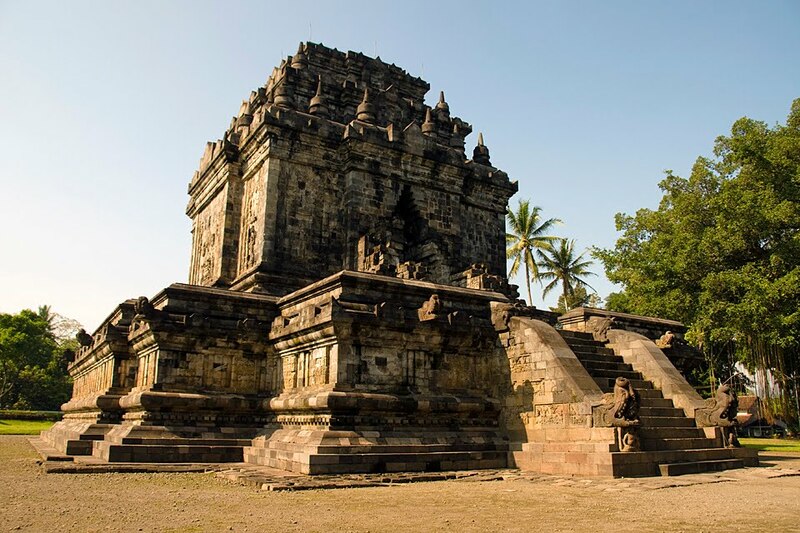 On the way to Prambanan, on the other side of Yogyakarta, we stopped at the relatively small Mendut Temple, also built in the ninth century. 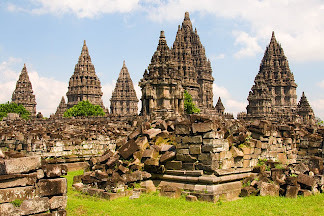 It was another hour to Prambanan, a Hindu temple compound built around the same time as Borobudur and Mendut. It was in use for less than 100 years before it too was abandoned. The compound contains well over 200 temples, but most of them are just piles of rubble, having been ravaged by earthquakes, volcanic eruptions, and looters over the centuries. The inner complex contains eight main towering temples, featuring statues of Hindu deities and ornately carved reliefs telling the story of the Ramayana. 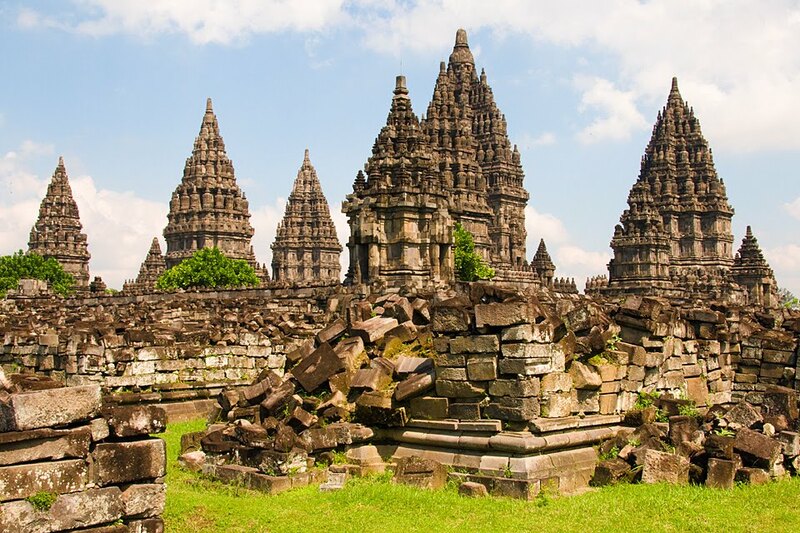 While impressive in scale, Prambanan lacked the enchanting atmosphere of the imposing Borobudur. Next time, maybe I should visit in the early morning when there aren't so many tourists. I spent the next two days exploring the city of Yogyakarta. 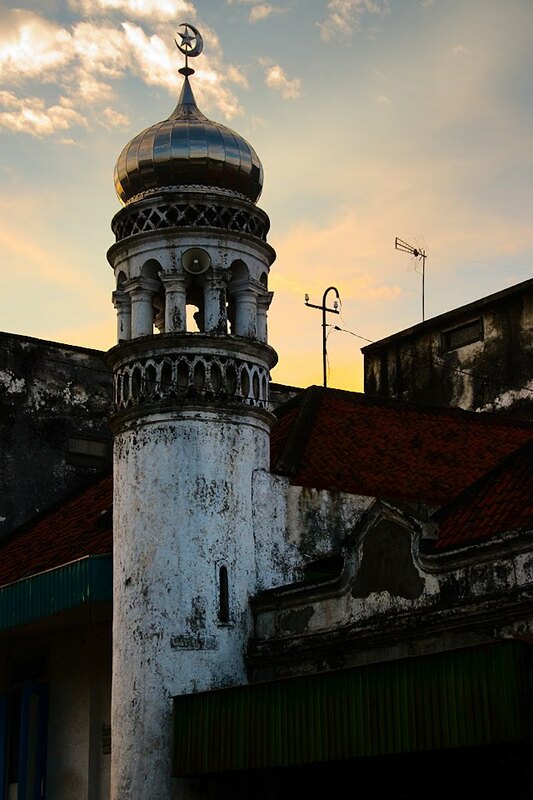 On Sunday evening, I walked along the main street, Jalan Malioboro. An endless chain of stalls sold t-shirts, sandals, and souvenirs, and I had to wade through a slow-moving river of people. Motorbikes were parked six abreast on the sidewalk, and hundreds of people walked in the street. If the person in front of me stopped to look at a stall, I had to wait until they moved along – there was no space to bypass them. Today I visited the Kraton, the palace of the sultan of Yogyakarta. 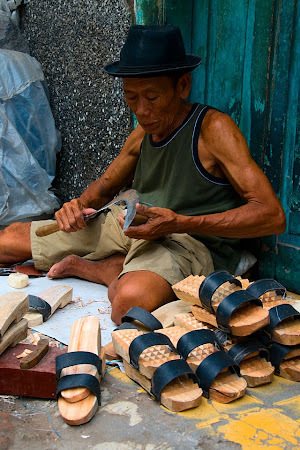 Yogyakarta is a specialized province of Indonesia that still functions as a monarchy, as it has since precolonial times. The sultan serves as the provincial governor, but he is unique from other governors in Indonesia in that he is not held to a term limit. 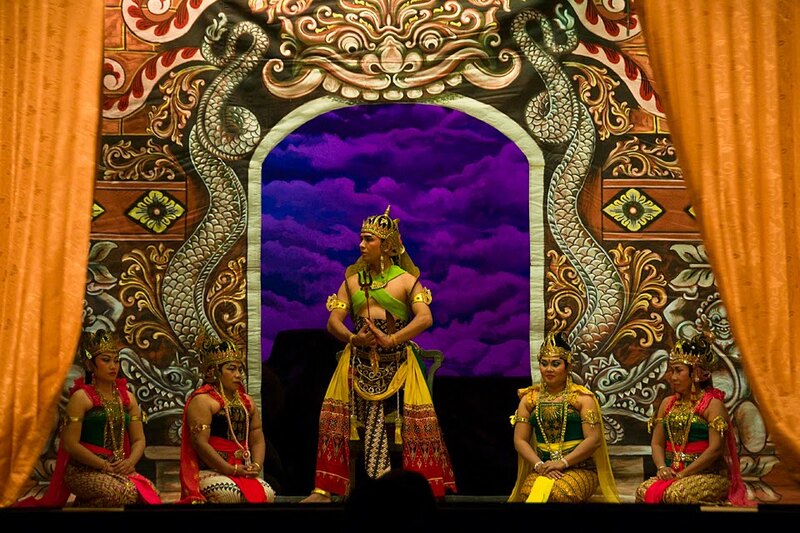 The Kraton is only open at limited times of the day because it is actually a functioning royal palace. 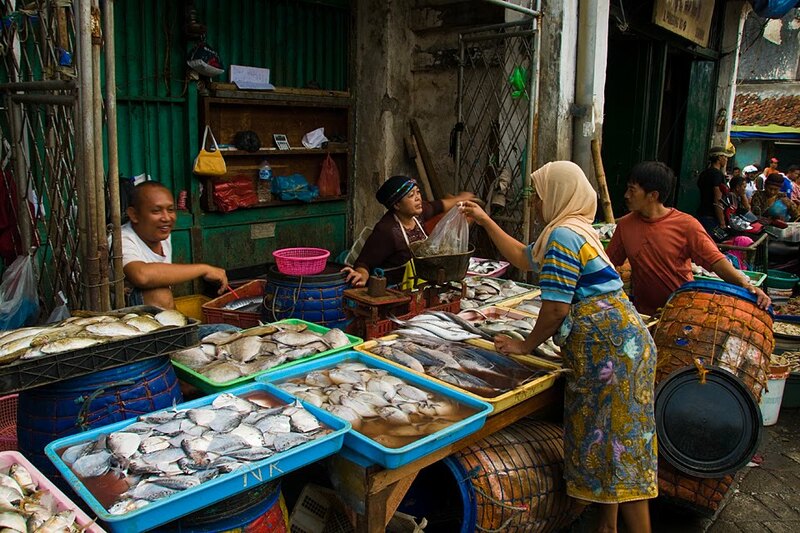 Yogyakarta has also been a good place to try some unusual Javanese food. For dinner on Sunday, I ate cobra prepared in a spicy tongseng style. It tasted similar to alligator with hints of calamari (although less rubbery). The meat had been sliced from the snake in such a way that the pieces naturally assumed a rolled form, approximating a tube-like shape. I also tried kopi luwak, or civet coffee. Because of its unusual production process, this is allegedly the rarest and most expensive variety of coffee in the world. A weasel-like creature called the Asian palm civet, which lives in Sumatra, Java, and other areas of Indonesia, eats the ripest coffee cherries. The fruit is digested, but the civet excretes the beans, which are collected from the dung, washed, dried, and roasted. Enzymes in the civet's digestive system are infused into the beans, resulting in a much less bitter coffee with subtle, unique flavors. I'm no coffee connoisseur, but I could tell a difference between kopi luwak and all other coffees I've tried. I usually put a lot of cream and sugar in my coffee, but I drank the kopi luwak black, and it was not bitter at all. It was definitely the best coffee I've ever had, and at only $10 for two cups, a bargain. 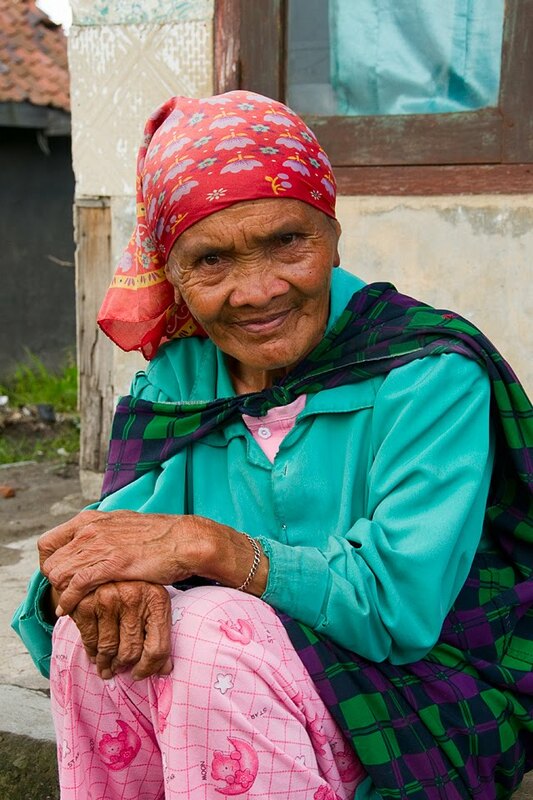 As one of the rarest coffees in the world, kopi luwak sells for as much as $600 per pound elsewhere in the world. On the way back to my losmen, I decided to withdraw a bit of cash from an ATM. I wasn't desperate, but it would be my last chance to get cash until Jakarta. It was one of those split-second decisions that drastically alters future events. After I received my cash, my card didn't eject far enough from the slot. I could see the card refracted through the curved plastic slot cover, but the edge of the card was just barely inside. The ATM beeped persistently and mockingly, telling me to take my card. It was tantalizingly close; if I had a pair of tweezers, I could have grabbed the edge of the card. And then, the inevitable happened: the machine sucked my card deep into the abyss of its dark, impenetrable guts. The ATM version of the "blue screen of death" appeared, indicating in both Bahasa Indonesia and English that the machine was out of order. All hope was lost. A man behind me in line gave me a ride on his motorbike to the nearest bank branch to see if there might be a maintenance person around. Apparently, banks here close at 3 p.m., and it was ten after. More bad luck. But I did meet an incredibly helpful English-speaking guy who advised me that I would probably not be able to get my card back in Yogyakarta even during bank hours. 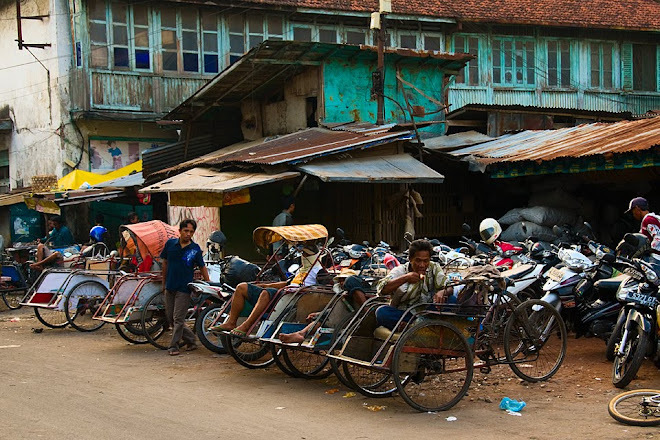 I was better off continuing with my plans and taking the overnight train to Jakarta. It is bank protocol to send lost cards to the main bank, so if I could retrieve my card at all, it would have to be done in Jakarta anyway. He also suggested I report the incident to the U.S. embassy to see if they might be able to help. It is quite a predicament, and I don't have much time to resolve this issue. 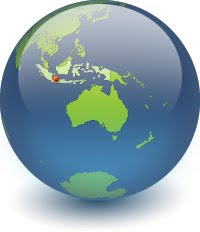 My Indonesian visa expires in two days, and I've already booked a flight to Singapore. I really don't want to go through the trouble of extending my visa and delaying my flight just for a lost card. In fact, this is the second flight I've booked to Singapore. 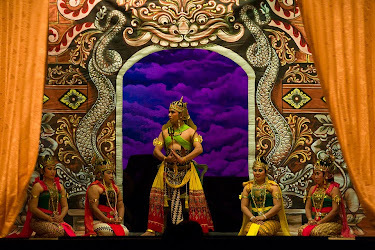 I canceled the first one after I realized I needed much more time to see everything I wanted to see in Indonesia. To miss one flight is bad enough; to miss two would be ridiculous. Will I ever make it to Singapore? Although my room in Probolinggo was the definition of bare bones, the hotel was nice enough to arrange transport to Mount Bromo for me – and it cost less than $4 for the one-hour trip through jaw-droppingly beautiful terrain. We twisted through a verdant, undulating landscape of terraced farmland that more than made up for the sub-par impression of Java I had developed when I first arrived. Morning mist hung suspended in the deep valleys, lending a mystical atmosphere to the vista. The fertile quality of the volcanic soil was evident here, where tropical foliage burst from the hillsides in explosions of green punctuated by colorful splashes of flowers. Impossibly steep fields blanketed the precipitous sides of the hills, guarded by farmhouses carefully placed on the slopes like sentinels. 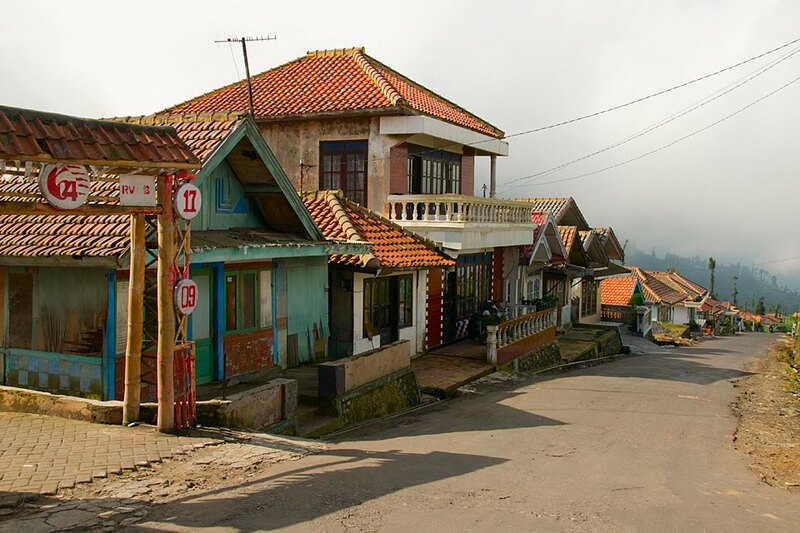 Up, up, up on the steep road, and we finally arrived at the picturesque little village of Cemoro Lawang, perched on the rim of the epic Tengger crater. 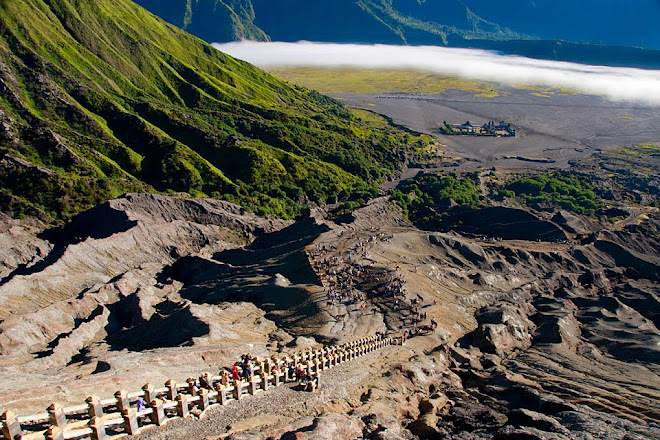 Inside this six-mile-wide crater are five smaller volcanoes (including the infamous Mount Bromo) rising like phoenixes from a massive, desolate sea of black volcanic sand. At 7,500 feet, it was much cooler and less humid than in sea-level Probolinggo, so I decided to go for a hike along the rim of the crater. I walked along rural trails, passing only farmers, while I gazed at the apocalyptic landscape below me. When I returned to town, I walked down the steep main road for a while until it started to rain. The temperature continued to drop into the evening, and it eventually became quite brisk outside. I actually had to sleep under a blanket for the first time in weeks, but I'm not complaining. An old woman sits outside her home in Cemoro Lawang, Java, Indonesia. At the brutal time of 3:30 in the morning, I woke up and got ready to meet my transport to Mount Penanjakan, where I would watch the sun rise over the Tengger crater and Mount Bromo. At four o'clock, our jeep entered the gate of Bromo Tengger Semeru National Park, and we endured a bone-rattling ride down the rim of the Tengger crater, across the vast black volcanic plain, and up the winding road to the summit of Penanjakan at 9,000 feet. Considering that Cemoro Lawang was the only town around, and that I only saw a few other jeeps entering the park, I figured that there would not be many people at the summit. Unfortunately, I was dead wrong: it was packed with tourists! I was shocked, because I had not seen any foreigners at all on my way to Probolinggo, and there are not that many places to stay in Cemoro Lawang. I think most of them were on package tours, so who knows where they started off this morning. The sheer number of tourists did take away from the magic of the experience a bit, as I had to fight my way to the fence to get a glimpse of the view. But what a view it was! When the first rays of the sun lit that otherworldly, desolate panorama, I forgot all about the hundreds of other people that were watching with me. The plain was shrouded in a thick blanket of mist, and the Tengger crater's perfectly formed volcanic peaks rose like islands from a white, ethereal sea. A wafting column of steam escaped from the highly active vent of Mount Bromo, reflecting the pink glow of the morning sun, and the gigantic Mount Semeru (at 12,000 feet, the highest peak in Java) stood watch over the entire scene from the hazy distance. It was one of the most sublime and enchanting vistas I have ever witnessed. After sunrise, we headed back down into the Tengger crater, where I set out on the path that leads to the very rim of Mount Bromo itself. I traipsed across the sandy volcanic soil, passing a uniquely positioned Hindu temple nestled at the foot of the active volcano, and began to climb up the rocky slope. The final ascent features a steep stairway that ends on the precipitous rim of the crater. Out of breath and breathing only the sulfuric fumes belching from the volcanic vent of Bromo, I finally reached the top. One side of the narrow rim dropped precariously into the steaming crater; the other side descended at a slippery angle all the way to the plain below. It was one of those special places that begs you to step outside of the moment and say to yourself, "I can't believe I'm really here."